I'll be giving a 75 minute performance demonstration on October 3, 2017 at the University of North Carolina - Greensboro School of Music at 9:30am. SADUBAS (Ameet Mehta and Robin Sukhadia) with special guest Clinton Patterson (trumpet) perform a special 2 hour set poolside at CalArts to celebrate the inauguration of Ravi Rajan, the new President of CalArts. 5-7pm. Numi Foundation’s mission is to nurture and empower thriving communities. We envision a world where all basic human needs are met and people have the resources to fulfill their greatest potential. Globally, Numi Foundation provides organic, fair trade farming communities with access to clean, safe drinking water. And in Oakland, California Numi Foundation offers experiential gardening, arts and social studies curricula to low-income K-8 public schools. Rajib Karmakar and Robin Sukhadia present an evening of Ragas for the Foundation. Robin Sukhadia is a disciple of tabla maestro, Pandit Swapan Chaudhuri. in 2011, he completed a Senior Research Fulbright Fellowship in India, where he developed 6 music education programs across India and Nepal, each serving children in some of the poorest regions and communities of south Asia. 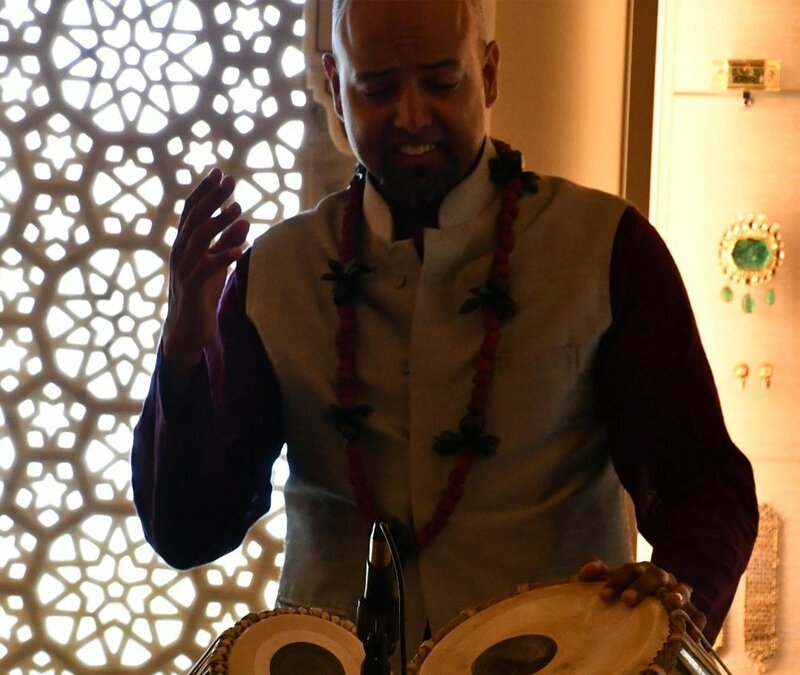 He has lectured and developed innovative music education programs centered on classical Indian music and south Asian culture at The Los Angeles County Museum of Art, Stanford University, The Asian Art Museum in San Francisco, The GRAMMY Museum, and at Carnegie Hall. Robin currently serves as an Advancement Officer for The Colburn School, considered among the world's foremost institutions for music education. Robin holds an MFA in Indian Classical Music from the California Institute of the Arts. More info at www.tablapusher.com. SADUBAS, aka The Sadhus of Bass invite you for an intimate evening of audio visual delight converging classical Indian rhythms with 70's Bollywood vibes and modern day electronics to create psychedelic soundscapes that examines the current state of the Union. Kicking off the sessions is special guest artist and beat conductor extraordinaire, Roarkyd. •Locate the alley on the left hand side of Full House. •Notice dumpster on your right hand side. •Take a right and continue down the alley. •Exercise caution so as not trip on the wobbly cement blocks underfoot. Envisaged back in 1981 as an audiocassette publication, The Tellus Project, produced and curated by Carol Parkinson, Joseph Nechvatal and Claudia Gould, is now considered a historic and significant archive of New York’s leading “downtown” experimental sound, noise, performance and spoken word artists. The tapes included works by Sonic Youth, Louise Lawler, Elliot Sharp, Glenn Branca, Tom Cora, Fred Frith, and Spaulding Gray among others. Assembled as a series of twenty-seven audiotapes, each tape was titled with a number and a theme that reflected their sequential release and the curator’s research and intention. The tapes were compiled and distributed to their subscribers, bimonthly through the mail. Tom Leeser is a media artist, educator, curator, and writer. He is Program Director of the Art and Technology Program and Director of the Center for Integrated Media at the California Institute of the Arts (CalArts.) Tom received his BFA and MFA from the San Francisco Art Institute (SFAI.) His film, video, sound, online work, interactive installations, and public performances have been exhibited at Eyebeam, the Academy of Motion Picture Arts and Sciences, Machine Project, the Mount Wilson Observatory, MassMoca, The Santa Monica Museum of Art, The Fowler Museum, Redcat Theater, The Kitchen, The Millennium, Siggraph, and film and video festivals worldwide, with support from Art Matters, Creative Time, and the Daniel Langlois Foundation. Recent projects include: DryRun, a public art and sound/poetry project for the City of Santa Clarita, History Refused to Die and The Futures Project at the Alabama Contemporary Center for the Arts and the Los Angeles Filmforum, Artist Resident for a Day at Machine Project, Radical Cosmologies at ISEA2012, Indirect Intention—A Home and Garden Intervention at the Museum of Jurassic Technology and the Center for Land Use Interpretation, Future Imaginary at the Ben Maltz Gallery of the Otis College of Art and Design, The Lament Project—An Evening at the Manual Archives, Underground Cinemamachine at Machine Project and Object Lessons for Gigantic Artspace in New York City. He is an editor and producer for the web-based journal and curatorial project viralnet.net. Leeser extracts images and text from their original sources and integrates them into a “media archeology” that challenges their original meanings and context. M. Lovejoy,PostmodernCurrents(Ann Arbor, MI: Univ. of Michigan Research Press, 1989) p. 154. 7:00 PM – 8:30 PM - Literary Interpretations of Bollywood - Six writers riff on the highs and lows of Bollywood film. Featuring: Neelanjana Banerjee, Xochitl-Julisa Bermejo, Saurabh Kikani, Kenji Liu, Nihar Patel, and Minal Hajratwala. Kalakari Collective will be selling one of kind Bollywood art and clothing all day! The Bollywood Bites food truck will be parked outside from Noon to 3:30pm! Robin is a Bollywood scholar and a disciple of tabla maestro, Pandit Swapan Chaudhuri. In 2011, he completed a Senior Research Fulbright Fellowship in India, where he developed 6 music education programs across India and Nepal, each serving children in some of the poorest regions and communities of South Asia. More at www.tablapusher.com. The “Family Dance Jam” comes to Tongva Park, in Santa Monica. Featuring two 45 minutes sets, the “Family Dance Jam” is an inter-generational movement workshop designed for people of all ages, incorporating both open play and directed experience, ensuring that each participant and family gets their own unique dance party. Sadubas, a DJ duo featuring Ameet Mehta and Robin Sukhadia, that combines recorded with live drums, will provide the soundtrack, and the “Family Dance Jam” team of dancers will be there to help create an environment of fun and creativity. This is an event that is guaranteed to provide a good time for all family members. Performances by South Asian writers and musicians examining their connection to the American Dream, curated by Tabla Artist Robin Sukhadia. Writers Neelanjana Banerjee, Tanzila Ahmed and SETI X present original work scored live by Sadubas (featuring Robin Sukhadia, Ameet Mehta and Azeem Khan). This event is free and open to the public. Pie and coffee will be served. I’ll be performing with Aalok Mehta and Ireesh Lal on the main stage and the Acoustic Space on August 6, 2016. We are very excited to announce the musical and creative lineup for Biorhythmla with tons of unique rooms and spaces for you to discover! Body painted performers will surround you everywhere you go!